I Thomas Bratcher Hemphill of the aforesaid county and state, being of sound mind, but considering the uncertainty of my earthly existence, do make and declare this my last will and testament. First My Executor hereinafter named shall give my body a decent burial, suitable to the wishes of my friends and relatives. And for all funeral expenses together with all any just debts out of the money which may come into his hands belonging to my estate. Second I give and devise to my beloved sister Mary Ann McEntire’s legal heirs and Thos. A. Porter and Wm. Y. Porter equally my entire landed property and all [?] chattel [sic] property & in said state. second [sic] I give and devise to my two nieces [sic] Mary Jane Stroud and Josephine Butler of Georgia my land in Murry [sic] County Ga.
Third I give and bequeath to my beloved nephew J. C. McEntire my rifle gun. Fourth I give and bequeath to my beloved nephew John Bratcher Porter son of Thomas Porter my double barrel shot gun. Fifth I give and bequeath to my beloved neice [sic] Rosanna Barrett my horses mules and wagon, buggy etc. 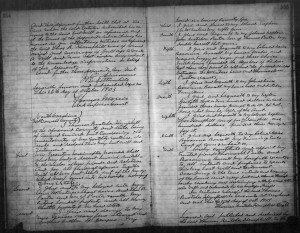 hogs and three choice milk cows provided she stays here if she does not then they must be sold and the proceed divided between the McEntire heirs and Thomas & Wm Porter (equal). sixth I give and bequeath to my beloved neice [sic] Rosanna Barrett my household and kitchen furniture. seventh I give and bequeath to my nephew Geo. Lytle three or four hundred dollars in cash provided theres money enough to do it. If not have what may be left of the Amt. Eighth I give and bequeath to my beloved nephew Thos. Hemphill son of Jas. Y. Hemphill one hundred dollars provided theres money to pay it. 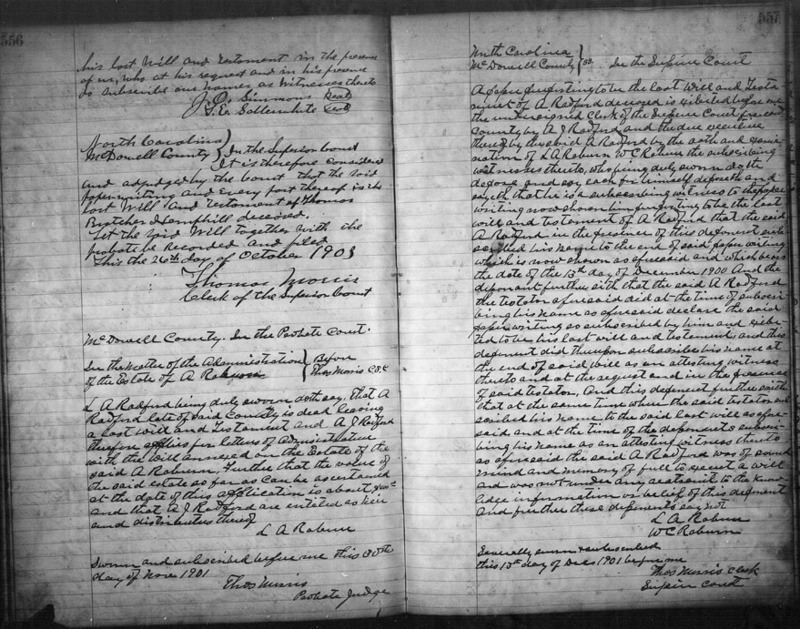 Ninth I give and bequeath to my beloved neice [sic] Rosanna Barrett my farming tools Crop of corn & wheat &c.
Tenth I hereby constitute and appoint my trusted friends Thomas A. Porter and Rosanna Barrett my lawfull executor to all interests and purposes to execute this my last will and testament. According to the true intents and meaning of the same and every part and clause thereof hereby revoking and declaring utterly void all other wills and testaments by me heretofore made. In witness whereof I the said Thomas Bratcher Hemphill do hereunto set my hand and seal. This the 22nd day of Oct. 1903. Signed and published and declared by the said Thomas Bratcher Hemphill to be his last will and testament in the presence of us, who at his request and in his presence do subscribe our names as witnesses thereto. And adjudged by the Court that the said paper-writing and every part thereof is the last will and testament of Thomas Bratcher Hemphill deceased. This the 26th day of October 1903. 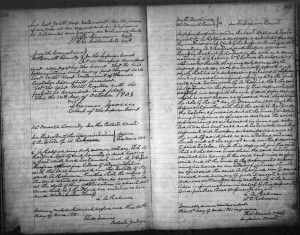 Source: McDowell County, North Carolina, “North Carolina Probate Records, 1735-1970”, will book entry for Thomas Bratcher Hemphill pp. 554-555, digital images no. 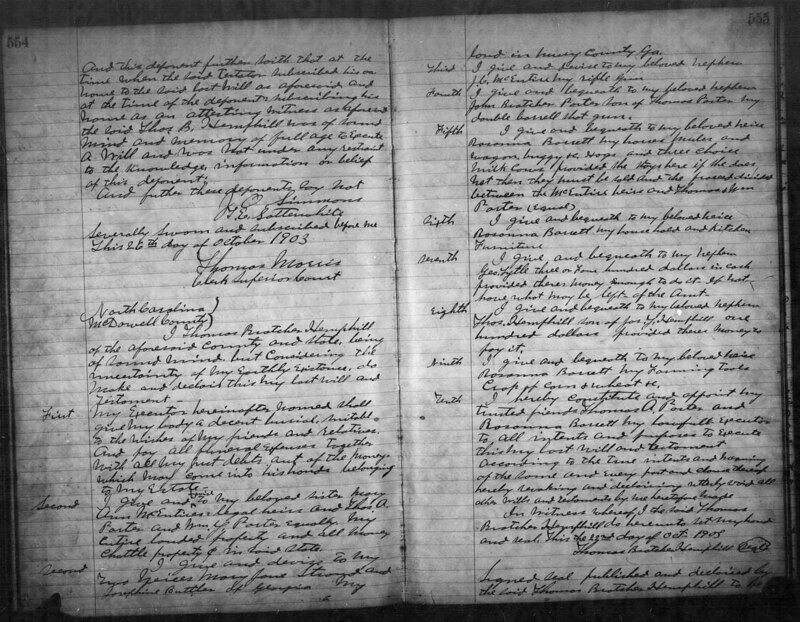 308-309; “Wills 1869-1903,” digital images, FamilySearch (http://www.familysearch.org: accessed 30 June 2011). What can you learn from a DAR application?